When fire is showing from one or more windows or other opening on arrival, firefighters and fire officers often observe that the fire is �self-vented�. While this is true, this unplanned ventilation often increases heat release rate and does not have the desirable effects resulting from effective tactical ventilation. 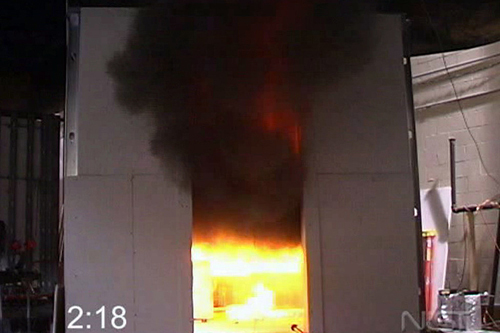 Effect of Positive Pressure ventilation on a Room Fire (Kerber & Walton, 2005) describes a series of experiments performed at the National Institute of Standards and Technology (NIST) to determine the effect of horizontal ventilation using a window and door under natural and positive pressure conditions. These experiments involved a compartment with a single window and doorway as illustrated in Figure 1. 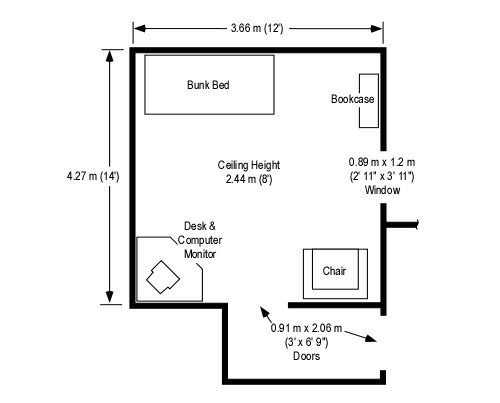 The room was furnished as a bedroom with a limited fuel load consisting of a bunk bed, bookcase (without books), chair, and desk with computer monitor. As illustrated in Figure 2, with natural ventilation the heat release rate (HRR) spiked immediately after the window was vented. As heat release rapidly increased, so too did temperature with peak temperature at the ceiling in excess of 1000o C (1832o F). After establishing natural horizontal ventilation by opening the window, a bi-directional air track developed at both the window and door to the compartment as illustrated in Figures 3 and 4. If this compartment was at the end of �a long hallway, what impact would the air track and temperature conditions have on firefighters working their way to the seat of the fire? Click on the link to view video providing interior and exterior views: NIST Natural Horizontal Ventilation Test . Additional information on natural and positive pressure ventilation tests is also available on the NIST PPV web page. Horizontal ventilation is often performed to lower temperature and raise the level of the hot gas layer in the fire area. While increased ventilation may accomplish this, failure (or tactical ventilation) of a single window is unlikely to have significant impact on compartment temperature. Researchers from the University of Texas and the Austin Texas Fire Department (Weinschenk., Ofodike,& Nicks, 2008) performed a computer simulation of the impact of variation in the size of the exhaust opening when performing horizontal ventilation using a window and door. 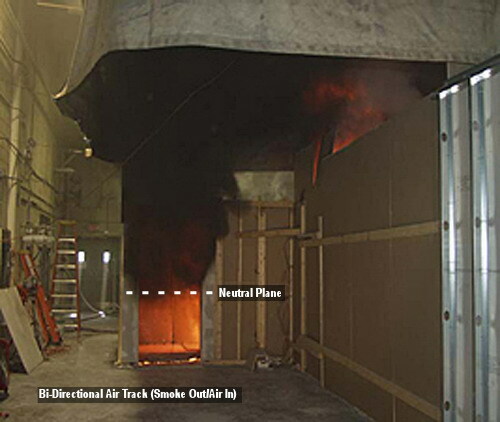 The compartment size was slightly smaller than in the NIST study (Kerber & Walton, 2005) and the fire was considerably smaller (2 MW). In this simulation they examined conditions varying from the window being closed to fully open. 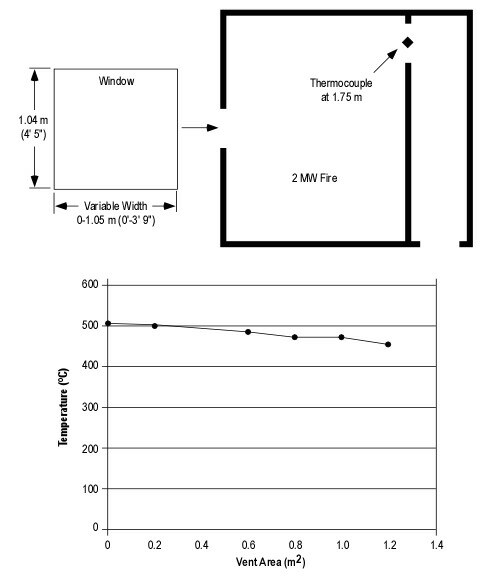 As illustrated in Figure 5, even with the window fully open, the temperature in the doorway of the compartment dropped only slightly. It is essential to recognize that unplanned ventilation caused by failure of window glazing due to the effects of the fire are unlikely to result in sufficient exhaust opening size to have a significant positive influence on conditions inside the fire compartment and adjacent spaces. What smoke, flame, and air track indicators would point to ventilation controlled conditions? Take a look at Figures 3 and 4! How might tactical anti-ventilation and/or tactical ventilation be used to positively influence fire conditions and the environment in the compartment? Horizontal ventilation is an excellent tool when used correctly. However, not understanding the influence of changes to the ventilation profile when the fire is ventilation controlled, can have disastrous consequences. Ventilation direction (horizontal or vertical), size and location of inlet and exhaust openings, and coordination with fire control are critical to safe and effective fireground operations. For more information, see the following NIST report and journal article. Weinschenk, C., Ofodike, E., & Nicks, R. (2008) Analysis of fireground standard operating guidelines/procedures for compliance for Austin fire department. Fire Technology, 44(1), 39-64. I am involved in an ongoing project to assemble and examine narratives, incident reports, and investigations related to extreme fire behavior events. Unfortunately many of these documents relate to line of duty deaths. As I read through the narratives included in the United States Fire Administration line of duty death database and annual reports on firefighter fatalities, I realized that every week represents the anniversary of the death of one or more firefighters as a result of extreme fire behavior. While some firefighters have heard about the incidents involving multiple fatalities, others have not and most do not know the stories of firefighters who died alone. In an effort to encourage us to remember the lessons of the past and continue our study of fire behavior, I will occasionally be including brief narratives and links to NIOSH Death in the Line of Duty reports and other documentation in my posts. On January 28, Firefighters Vencent Acey and John Redmond, both of the Philadelphia (PA) Fire Department, died when he became trapped and overcome by smoke by a rapidly moving fire in the basement of a church. Several firefighters re-entered the church against orders to rescue the firefighters, and were able to pull one of them from the basement. Eight other firefighters were injured, including several involved in the rescue efforts. On January 28, Firefighter Victor Melendy of the Stoughton (MA) Fire Department died when he was caught in a flashover while searching for victims on the third floor of a rooming house. Captain Gass and other members of his department were dispatched to a residential structure fire that was caused when lightning struck a house. The first two firefighters on the scene, the Assistant Chief and the Fire Chief, confirmed a working fire with dark smoke and fire visible from the attic and dormers. Captain Gass and his crew were the first fire company to arrive at the scene. Captain Gass and two firefighters entered the structure through the front door to perform an aggressive attack on the fire. Shortly after entering the structure, the two firefighters who were with Captain Gass were attempting to feed more hose into the structure. There was a rapid buildup of heat and the hoseline seemed to drop. The firefighters exited the building and reported this situation to the Chief. Two Rapid Intervention Teams (RIT) were formed and, after four attempts, the second team was successful in recovering Captain Gass. Captain Gass was equipped with full structural protective clothing and a manually activated PASS device. The PASS was found in the “off” position. Captain Gass was located about 18 feet inside the front door of the structure. Captain Gass was removed from the structure approximately 20 minutes after his arrival on the scene. The cause of death was listed as smoke and soot inhalation with greater than 80 percent total thermal injury. Additional information about this incident may be found in NIOSH Fire Fighter Fatality Investigation F2000-09. If your department experiences (or has experienced) an extreme fire behavior event and you would be willing to share information about the incident or lessons learned, please contact me by e-mail or telephone. Thanks to Lieutenant Matt Leech of Tualatin Valley Fire and Rescue for letting me know that there are a number of broken links in my earlier blog posts. A fix is in the works and hopefully all links will be functional by next Monday. While researching the Iowa Fire Flow Formula, I came across some interesting information (trivia?) related to the use of water fog for firefighting. In The Safe and Effective Use of Fog Nozzles: Research and Practice, John Bertrand and John Wiseman observed that fog nozzles have been in existence for more than 100 years.. Early versions of this type of nozzle were imported to the United States from Europe. In 1924, Glenn Griswold, a firefighter from Colorado Springs moved to California and joined the newly formed Los Angeles County Fire Protection District. He quickly rose to the rank of Captain and was assigned to Station 17 in Santa Fe Springs. Captain Griswold applied his prior education as a hydraulic engineer to the practice of firefighting and experimented with development of a nozzle to break water into small droplets. Eventually he patented the design under the name Fog Nozzle. Subsequent innovations in the design of combination nozzles resulted in nozzles that could maintain the same flow rate regardless of pattern, adjustable flow nozzles could be set to provide different flow rates while maintaining consistent flow for all patterns, and finally automatic nozzles that maintained a relatively constant nozzle pressure through a specific flow range. However, there was a reference to the January 1877 issue of Scientific American in Nelson�s Qualitative Fire Behavior that intrigued me. He stated that this article extolled the virture of little drops of water and the latent heat of steam and that it attempted to point out in a scientific manner that spray or fog nozzles could greatly increase the efficiency of the fire service. I located a copy of the magazine in the archives of the Portland State University library. The article that Nelson referenced, was actually a letter to the editor written by Charles Oyston of Little Falls, NY. In our issue of December 30, you recommend discharging water through perforated pipes in the form of spray for extinguishing fire. If water in the form of spray be a good extinguisher, as it undoubtedly is, as numbers of proofs exist in our factories and picker rooms, why do not our fire departments use it in that form in all cases where they can? Leaving firemen to answer that question, I will proceed to adduce a few facts in support of the theory that a spray is the true method of applying water wherever the burning object can be reached by it. Water operates, in extinguishing fire, by absorbing the heat and reducing the temperature of the burning substance so low that fire cannot exist; and as the amount of heat that water will absorb depends on the amount of surface of water in contact with the fire, the more surface we can cover with a given amount of water the better. As flame is the principle propagator of fire, to arrest it is the first thing to do; and as it is more than three thousand times lighter than water, and in most cases a mere shell or curtain, a fraction of an inch thick, the extreme absurdity of trying to subdue it with solid streams of water will be apparent. If a man in the character of a sportsman were to fire an inch ball into a flock of humming birds, with the intention of killing as many as possible, he would be regarded as a fool; but if he were to melt the inch ball up, and cast it into shot one thirtieth of an inch in diameter, he would have twenty-seven thousand such shot, and their aggregate surface would be thirty times greater than the inch ball. If he were to load his gun with this shot and fire into the flock, at proper distance, the slaughter of the little beauties would be terrible; and if a fireman would divide up his stream into spray, so that he could cover thirty times more flame, he might expect a corresponding result. The globules of water would be so small that a large portion of them would be heated through and converted into steam; and as steam contains five more heat (latent) than boiling water, we gain a great advantage in this. Steam is also an excellent extinguisher, and this is an additional advantage. As a large portion of this water is converted into steam when applied in the form of a pray, a small amount serves, and the damage by water is very small. If the first two engines that reached the burning Brooklyn theater could throw five hundred gallons of water each minute, and divide every cubic inch of water into sixty thousand drops, in two minutes the smoke and heat would have been sufficiently subdued to have enabled outsiders to enter and rescue the unfortunate inmates. I am well aware that this statement may seem extremely absurd to firemen who have never experimented in this line; but before they condemn it, let them take out a couple of engines and try the experiment. The barbarous system now in use that so frequently desolates portions of our cities, fills our houses with mourning and our cemeteries with new-made graves, must give way to the dictates of Science. Humanity demands it, and I call on the scientists and chemists throughout the land to aid in introducing this needed reform. Oyston does not mention that he holds a patent for a device called Improvement in Nozzles which used a series of movable hooks inside a relatively standard solid stream nozzle to create a broken stream pattern of broken droplets. In the Fire Stream Management Handbook, David Fornell astutely observes that attempting to introduce change in the 19th century was apparently as difficult as it is today. While it is obvious that Oyston is not a firefighter or fire protection engineer with a sound understanding of the tactical applications of straight streams and water fog in firefighting operations, he did have a reasonable grasp of the basic physics involved in the use of cooling for fire control and extinguishment. His call for scientists and chemists to weigh in on the issue resonated strongly with me as firefighters stand across a chasm from scientists, engineers, and researchers. Much progress has been made in this regard in other nations such as Sweden and in the US by the work of the National Institute for Standards and Technology (NIST) and others. However, this integration of science with the practical experience of firefighting needs to continue and be expanded. This post attempts to bring some clarity to a few scientific concepts that are often overlooked or oversimplified in fire behavior training for firefighters and fire officers. I have made an effort to make this information accessible, but not to reduce it to the point where it no longer makes sense from a scientific perspective. In physics, power is the rate at which work is performed or energy expended for a given unit of time. For combustion, power is the energy released per unit of time or heat release rate (HRR). So what? Why is this important to firefighters? It is relatively easy to describe how big a compartment or building is based on its dimensions (i.e., length, width, height) in meters (or feet). However, describing how big a fire is requires different units of measure. Likely the best way to describe the size� of a fire is on the basis of the rate at which it is releasing energy. In Heat Release Rate: A Brief Primer, Dr. Vytenis Babrauskas observes that Heat Release Rate (HRR) is the driving force that influences many other dimensions of the fire environment. As HRR increases, temperature and the rate of temperature change both increase, accelerating fire development. In addition, increased HRR results in reduced oxygen concentration and increased production of gaseous and particulate products of incomplete combustion. For firefighters, it is also important that HRR directly relates to flow rate required for fire control. Energy is often defined as the ability to do work or cause change. Thermodynamic work is the transfer of energy from one system to another. This is sometimes, but not always accompanied by an increase in temperature (more on this in a bit). In the United States, the traditional units of measure for energy were the British thermal unit (Btu). A Btu is the amount of energy required to raise the temperature of one pound of water from 60o F to 61o F. Adding additional Btu will continue to raise the temperature of the water until it reaches its boiling point. Changing phase from liquid to gas requires input of a large amount of energy, but there is no change in temperature! The standard international (SI) unit for energy is the Joule (J). The joule is defined in terms of mechanical energy. However, in our context, it is useful to describe the Joule in terms of transfer of thermal energy. 4186 J will raise the temperature of 1 kilogram (kg) of water from 20o C to 21o C. For readers who are more comfortable with Btu, one Btu is equal to 1055 J (slightly more than one kilojoule (kJ)). To keep things simple, the remainder of this post will stick to the SI units (Joules, Watts, and oC). Energy that is stored is known as potential energy. Fuel has chemical potential energy that is released as the fuel is oxidized in the combustion process. The energy that is released through complete combustion of a given mass of fuel is known as the heat of combustion. Heat of combustion is dependent on the chemical makeup of the fuel. Heat of combustion is usually expressed in kilojoules/gram (kJ/g) or megajoules/kilogram (MJ/kg). Note: Data in this table is from the Society of Fire Protection Engineering (SFPE) Handbook of Fire Protection Engineering. Heat of combustion is important, but as Dr. Babrauskas points out, the rate at which that energy is released is even more important. Heat release rate is influenced by a number of different fuel characteristics such as surface area to mass ratio, orientation (e.g., horizontal, vertical), arrangement, and geometry. The concepts of heat of combustion and heat release rate help explain changes in the built environment that impact firefighting. Increased use of synthetic materials has increased the chemical potential energy of building materials and contents and higher heat release rates shorten time to flashover. Release of chemical potential energy from fuel depends on availability of adequate oxygen for the combustion reaction to occur. Interestingly, while the heat of combustion of various types of organic (carbon based) fuel varies widely, the amount of oxygen required for release of a given amount of energy remains remarkably consistent. In 1917, British scientist W.M. Thornton discovered that the amount of oxygen required per unit of energy released from many common hydrocarbons and hydrocarbon derivatives is fairly constant. In the 1970’s, researchers at the National Bureau of Standards independently discovered the same thing and extended this work to include many other types of organic materials and examined both complete and incomplete combustion. Each kilogram of oxygen used in the combustion of common organic materials results in release of 13.1 MJ of energy. This is referred to as Thornton’s Rule. However, the concentration of oxygen in the atmosphere is only 21%. Examining the relationship between consumption of atmospheric oxygen and energy release requires adaptation of Thornton’s Rule based on oxygen concentration. Multiplying 13.1 MJ/kg of oxygen by 21% gives a value of 2.751 MJ/kg of air. The Society of Fire Protection Engineering (SFPE) Handbook of Fire Protection Engineering rounds this value to 3.0 MJ/kg of air. While it is easy to understand that air has mass, it is a bit more difficult to visualize a kilo of air! The density of dry air at sea level and at a temperature of 20o C is 1.2 kg/m3 (0.075 lbs./ft3). Air density decreases as temperature or moisture content of the air increases, but this provides a starting point for visualizing the relationship between volume and mass at normal temperature and pressure. All this is very interesting, but how does it relate to compartment fires and firefighting? In a compartment fire, combustion occurs in an enclosure where the air available for combustion is limited by 1) the volume of the compartment and 2) ventilation. Consider a 2.4 m x 3.7 m (8′ x 12′) compartment with a ceiling height of 2.4 m (8′). A compartment of this size has a volume of 21.312 m3 (752.63 ft3). Based on a potential heat release of 3 MJ/m3 of air, the volume of the compartment would provide sufficient air for release of 63.936 MJ. A fire burning in this compartment with a steady heat release rate of .5 MW would consume the air in the compartment in just over two minutes (127.8 seconds). However, this is an extreme oversimplification as fires generally begin with a low heat release rate and grow until they become limited by the availability of fuel or oxygen. In this case, the fire would burn for a bit longer and would then cease flaming combustion, but surface combustion may (depending on the type of fuel involved) continue for some time after the oxygen concentration drops below 15%. It is unlikely that a fire would occur in a compartment that had no openings (or at least potential openings) such as a door and one or more windows. Even if these openings are closed, there will likely be some leakage that will influence the amount of air available to support combustion. If they are open, a substantially greater amount of air will be available to support fire growth. However, as the fire develops and a hot gas layer forms and begins to fill the compartment, exiting smoke reduces the size of the opening serving as an inlet for additional air. As this occurs, the fire becomes ventilation controlled and heat release is limited by the amount of oxygen in the air available to support combustion. Many if not most fires that have progressed beyond the incipient stage when the fire department arrives are ventilation controlled. This means that the heat release rate (the fires power) is limited by the ventilation profile, in particular, the existing openings. 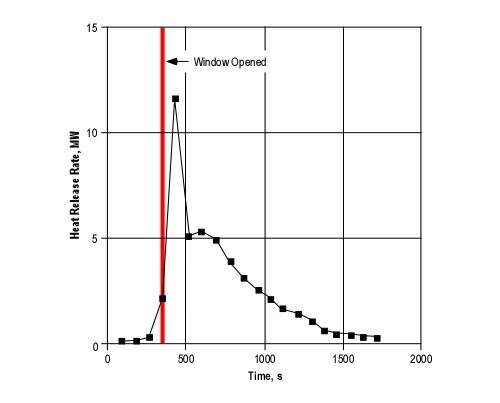 If ventilation is increased, either through tactical action or unplanned ventilation resulting from effects of the fire (e.g., failure of a window) or human action (e.g., exiting civilians leaving a door open), heat release rate will increase. Ventilation is a complex strategy as it can have both positive and negative effects. Releasing smoke can make the interior environment more tenable by raising the level of the hot gas layer and removing energy and fuel (hot smoke) from the compartment or building. 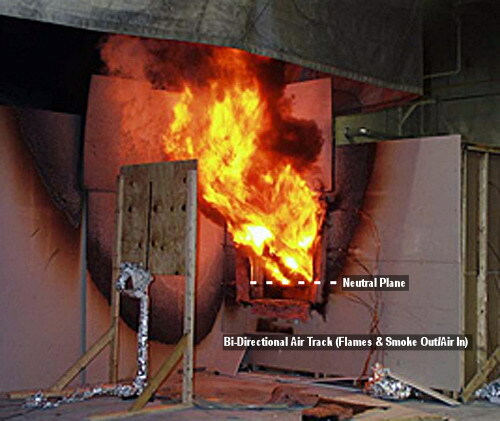 However, increasing the air supply to a ventilation controlled fire will increase the heat release rate, potentially resulting in a ventilation induced flashover. It is essential that firefighters and fire officers understand the effects of tactical operations on fire behavior and coordinate their efforts to maximize the positive impact while limiting the negative consequences. Chief Pete Lamb recently wrote a blog post titled Vent Early in which he emphasizes the need for firefighters to understand the application of ventilation strategies and to use them effectively. I suggest that we vent wisely in coordination with fire attack after considering fire behavior and building factors! Understanding compartment fire behavior and practical fire dynamics is critical to safe and effective ventilation operations. If you found this post interesting or useful (or not), please leave a comment with your feedback. Kernersville Fire Rescue and responded to a residential in the 1300 block of Union Cross Road shortly after 0200 hours on January 14, 2009. Occupants had been evacuated by two civilians returning home from work at a nearby Dell computer plant. First arriving units initiated offensive operations and began primary search to ensure that all occupants were out of the residence. Less than 15 minutes into initial operations, an explosion occurred resulting in partial collapse of the building. Kernersville Firefighter Jay Coleman and three firefighters from the Winston-Salem Fire Department were caught in the collapse, but were able to self-extricate. Firefighter Coleman suffered minor injuries. Chief Walt Summerville of Kernersville Fire Rescue reported “as we entered the building and began to ventilate and to flow air by moving hose lines, the heated gases got the air it needed”.� Chief Summerville believes the explosion was a backdraft, which was caused by a build-up of smoke in the crawl space of the home. A Kernersville police officer’s dashboard camera caught a burning home as it suddenly exploded. The police car was (appropriately) positioned a considerable distance from the house and provides a view of Side A from the Alpha/Delta corner. Watch the video several times to get a general sense of what happened Then download and print the B-SAHF Worksheet and identify any key indicators that might have be visible in the video. Post fire video and an interview with Firefighter Coleman are available on the WGHP Fox Channel 8 web site. At this point, information available about this incident is limited to news reports and video. However, we will be in touch with Kernersville Fire Rescue in an effort to obtain more detailed and fire behavior focused information about this incident. More to follow! Conditions can vary widely in different compartments. In this incident (like many others) flaming combustion is visible in one location, while extremely under-ventilated backdraft conditions exist elsewhere. Backdraft can occur in an entire building, one or more habitable compartments, or in a void space. Backdraft indicators may be pronounced, they may be subtle, or may not be visible from firefighters working positions. What additional information would you like to have> How could you obtain it? What conditions would you expect to find on Floor 2? Is the environment tenable for properly protected firefighters? Is it likely that the fire has extended to Floor 2? Why or why not? What changes in indicators did you observe prior to the egress of the crew of Pumper 223 from Floor 2? What changes in indicators did you observe following their egress from Floor 2? Were there significant indicators of worsening fire behavior visible from the exterior prior to the egress of the members working on Floor 2? What indicators of changing conditions would you have expected on the interior of Floor 2? What tactical options might have reduced the probability of developing untenable conditions on Floor 2? Review your answers on the B-SAHF worksheet. Did any of your answers change based on the additional information provided by the second segment of the video clip? Did you successfully predict the fire behavior that occurred? After completing the B-SAHF exercise, view the remainder of the video. Placement of the tip of the ladder above the window sill made egress from Floor 2 a bit more difficult. However, Captain Mark Fitzsimmons and Firefighters Geoff Mortimer and Mark Ashcroft from Toronto Pumper 223 escaped without serious harm because they recognized changing conditions and quickly made the decision to exit. As noted in my earlier post on Flashover & Survival Skills it is essential to train on emergency procedures, but it is even more important to ensure that firefighters and officers are proficient at reading the fire and managing the fire environment to reduce the probability that emergency procedures will be required. Thanks to Dr. Stefan Svensson for alerting me to a problem with the comments feature of the blog. The problem has been fixed and you can now provide feedback on the posts in the CFBT Blog. Please feel free to do so! As discussed in Estimating Required Fire Flow: The National Fire Academy Formula, there are a number of ways to estimate required (total) fire flow or tactical rate of flow (required for fire attack). This post examines the groundbreaking work of Keith Royer’s and Floyd W. (Bill) Nelson’s work in development of a method to identify the volume and flow of water necessary for fire control with water fog. The fire service often accepts (or rejects) concepts, theories, and practices based on what is written in training manuals, trade magazines, or presented by well known speakers. Others take the message and pass it along, trying to improve or simplify the message. Much can be lost in the translation. While we are strongly influenced by tradition, we occasionally forget history, and valuable work that was done by our predecessors is forgotten or misinterpreted. This is particularly true in the case with regard to Royer’s and Nelson’s volume and rate of flow formulas. In 1951, Keith Royer and Floyd W. (Bill) Nelson were hired by Iowa State University to manage the Engineering Extension Service Firemanship Training Program. Royer and Nelson both became involved in the Exploratory Committee on the Application of Water, a research team comprised of fire service, fire protection engineering, and fire insurance representatives. The principal work of the Exploratory Committee was investigation of the use of water fog for firefighting. One critical question faced by Royer and Nelson was how much water was necessary to control a fire with water fog? In his book Qualitative Fire Behavior (1989), Nelson observed: “In principle, firefighting is very simple. All one needs to do is put the right amount of water in the right place and the fire is controlled.”� Royer and Nelson recognized that heat release from the fire must be balanced by the energy required to heat water to its boiling point and change it to steam. Through their research, they discovered that too little or too much water was considerably less effective than the right amount. Note: While math is considerably simpler when using standard international (SI) units, Royer and Nelson did their work in traditional units (e.g., feet, gallons, British thermal units, degrees Fahrenheit). For now, I will stick with traditional units to illustrate how the Iowa Formula was developed. Safe and Effective Use of Fog Nozzles: Research and Practice (Wiseman & Bertrand, 2003) includes adaptation of the formula to the use of SI units. Based on the results of their research on extinguishing compartment fires, Royer and Nelson developed the following formula to determine the volume of water (in gallons) required to control a fire in a given size compartment. Water converted to steam expands at a ratio of 1700:1, as a result one gallon of water (0.13 ft3) produces 221 ft3 of steam. However, in practical application it is unlikely that all of the water would be converted to steam. Royer and Nelson estimated the efficiency of this conversion at 90%, resulting in production of 198.9 ft3 of steam per gallon. They rounded this value to 200 to simplify calculation. In 1955 the Factory Mutual Laboratories determined that oxidization of ordinary fuel with 1 ft3 of oxygen (at standard temperature and pressure) resulted in release of 535 British thermal units (Btu) of energy. Based on an atmospheric oxygen concentration of 21% and substantive reduction or cessation of flaming combustion at 15% concentration, Royer and Nelson estimated that seven percent (of atmospheric concentration of oxygen) was available to support flaming combustion. This led them to estimate that combustion of ordinary fuel with 1 ft3 of air would result in release of 37 Btu. Combustion of ordinary fuel with 200 ft3 of air (would therefore release 7,400 Btu. One gallon of water, raised from a temperature of 62o F to 212o F and completely converted to steam will absorb 9330 Btu. As with their calculation for steam production, an efficiency factor of 90% can be applied, resulting in absorption of 8397 Btu. This illustrates that a single gallon of water converted to steam will absorb the energy released by combustion of ordinary fuel with 200 ft3 of air. Note: There are a few problems in using volume when discussing the energy released based on the quantity of oxygen or air in the combustion reaction. Chief of which is the variation in volume based on temperature. It would be more appropriate to speak to the mass of oxygen or air. However, Royer and Nelson based their approach on volume, so we will follow this line of reasoning (recognizing that while it is simple to understand, it has significant limitations). Royer and Nelson used these concepts to support their formula to determine the volume of water required to control a fire with water fog. The Iowa Rate of Flow Formula is designed to estimate the flow rate required to control a fire in a single open area of a building with a 30 second application of water fog. This approach requires foreknowledge of the building and made the Iowa rate of flow formula most suited for preplanning, rather than tactical application. That said, this does not mean that you cannot apply this formula (or its concepts) tactically based on the estimated area of involvement in a building that has limited compartmentation (e.g., multiple, interconnected compartments, open doors, unprotected shafts). However, it is essential to remember that Royer and Nelson based their formula on a 30 second application (potentially from multiple points) outside the compartment, and not working your way from compartment to compartment as is typically done in offensive, interior firefighting operations. The concept that water applied to the fire compartment will turn to steam and fill the space, displacing air and hot smoke is a foundational principle of the indirect and combination attack as discussed by Lloyd Layman, Keith, Royer and Bill Nelson. This physical reaction is also commonly accepted as fact within the fire service. However, the science is a bit more complicated. Royer and Nelson are correct in assuming that at its boiling point water converted to steam will expand 1700 times and not increase in temperature. However, water converted to steam while passing through the hot gas layer does not increase the total volume of gas and vapor in the space. The expansion of steam is more than counterbalanced by contraction of the hot gas layer due to cooling. On the other hand, water that passes through the hot gas layer (without taking energy from the gases) and converts to steam on contact with compartment linings (walls, ceiling) results in addition of the volume of steam to the volume of air and smoke in the compartment. This is not commonly understood and will be the subject of a later post. Steam formed at 212o F (100o C) can continue to absorb energy if the temperature of the fire environment is above 212o F (100o C) and will continue to expand (while the hot gases correspondingly contract). One of the fundamental assumptions central to the Iowa formula is that the oxygen available to the fire is limited to that contained within the volume of the fire compartment. However, this is unlikely. If smoke is visible, ventilation (i.e., exchange of the atmosphere in the compartment with outside air) is taking place to some extent. In addition, if the compartment is not totally isolated from the remainder of the building, air track (movement of smoke and air) will provide additional oxygen to the fire. However, Royer and Nelson did identify an extremely important and often overlooked point. The Iowa tests showed that the heat release rate from actual compartment fires was less than the value based on the potential heat release from the fuel involved due to limitations in ventilation. In a compartment fire, heat release rate is often (except in the incipient and early growth stage) limited by ventilation. One of the most important lessons that can be learned from Royer’s and Nelson’s work is that the flow rate and volume of water required for fire control is related not only to the method of attack, but also to the ventilation profile of the compartment or building involved. The National Fire Academy Fire Flow Formula (see Estimating Required Fire Flow: The National Fire Academy Formula) is based on synthesis of the experience of a group of experienced fire officers. On the other hand, the Iowa Formula is based on analysis of extensive empirical evidence developed during live fire tests. These formula each have different assumptions and are designed for different purposes. However, both provide useful information if they are used as intended. Future posts will examine the topic of fire flow from an international perspective, looking at the approaches taken by Cliff Barnett from New Zealand and my colleague Paul Grimwood from the United Kingdom. For more information on Fire Flow, visit Paul Grimwood’s website www.fire-flows.com. Paul has amassed a tremendous amount of information on this topic from around the world. Application of the appropriate flow rate is critical to fire control. However, how can we estimate the flow rate that is necessary? There are a number of methods that can be used to estimate or calculate required flow rate for fire control. One method is to simply use your experience (which may work quite well if you have been to a large number of fires and paid attention to flow rate). However, if you do not have a large base of experience to draw on or need to apply flow rate estimation in a preplanning context, other methods are necessary. One of the most common methods used in the United States is the National Fire Academy (NFA) Fire Flow Formula. In the mid 1980s the development team for the National Fire Academy Field course Preparing for Incident Command developed this formula to provide a simple method for estimating the flow requirements for offensive, interior operations where a direct attack was used to control and extinguish the fire. Interestingly enough the NFA Fire Flow Formula is not based on science (at least not physical science). The developers tapped into another valid source of information, knowledge of experienced fire officers. The course developers designed a number of plot and floor plans showing different sizes of building with different configurations (e.g., rooms, doors, windows) with varied levels of involvement. These drawings were distributed to students attending the academy and they were asked how their fire department would control the fire (with the emphasis on the number, placement, and flow rate of hoselines). There are three major parameters used for the scenarios based on these plot and floor plans. All scenarios were designed to involve offensive, interior firefighting operations and as such, fire involvement was limited to 50% or less of the total floor area of the building. Operations were to be conducted as they normally would, with initial operations started by the first arriving company and additional tactics implemented as resources arrive. Primary search and ventilation tactics would be performed concurrently with fire control operations. The student’s responses were collected and analyzed. For each scenario, when the floor area of the involved area in square feet (ft2) was divided by the total flow rate in gallons per minute (gpm) for all hoselines used for attack, backup, and exposure protection; the average result was three. Turning this around, flow rate in gpm can be determined by dividing the area of involvement in ft2 by three. Note: This method does not translate easily into standard international (SI), simply converted the formula would be lpm = M2/0.07. The development team believed that this formula would also be applicable to defensive attack for levels of involvement above 50%. However, this was not validated using the same type of methodology as used to develop the base fire flow formula. The NFA Fire Flow Formula is designed for offensive, interior operations involving direct attack. The formula becomes increasingly inaccurate if the level of involvement exceeds 50% or the resulting flow is greater than 1,000 gpm. This method is not designed for defensive, master stream operations (even though the developers believed that it would provide a reasonable estimate of required flow rate for defense. The formula is based on area, not volume. If the ceiling height exceeds 10’, the flow rate may be underestimated. The developers of the NFA Formula made the assumption that the building was well ventilated (tactically). Increased ventilation can (if the fire is initially ventilation controlled) result in increased heat release rate. The most common application error is the belief that the formula determines the flow rate required for fire attack. This is incorrect! The formula determines the total flow rate required for attack, backup, and exposure protection lines. Use of this formula to determine the flow rate for the initial attack line (or lines) will greatly overestimate the required tactical rate of flow. As discussed in It’s the GPM! and Choose your Weapon Part I, substantially exceeding the required tactical rate of flow has diminishing returns on speed of extinguishment and substantially increases the amount of water used. If excessive, water that is not used efficiently (i.e., turned to steam) increases fire control damage). Using the NFA Base Fire Flow Formula (no exposures), roughly half of the flow rate is used for attack lines and the remainder is used for backup lines. The NFA formula provides an excellent method for estimating total flow rate requirements (which impacts on water supply and resource requirements). However, it must be adjusted (reduced by half) to determine the tactical rate of flow necessary for direct attack on the fire. As outlined in this post, the NFA Fire Flow Formula is intended for estimating the total flow rate required when making a direct attack and has a number of specific parameters that must be considered. Prior to introduction of the NFA formula, the Iowa Fire Flow Formula developed by Floyd W. (Bill) Nelson and Keith Royer. The Iowa Formula was developed quite differently, has substantially different assumptions, and will be the subject of my next post. For more information on Fire Flow, visit my colleague Paul Grimwood’s website www.fire-flows.com. Paul has amassed a tremendous amount of information on this topic from around the world. In 2008, six firefighters in the United States lost their lives in extreme fire behavior events occurring while they were engaged in interior firefighting operations. In 2008 there was only one multiple fatality line of duty death as the result of extreme fire behavior. Of this six, three were career, two were volunteers, and one was paid on call. They ranged in age from 19 to 54 years of age with an average age of 34.8 years. However, this does not give us the real picture, it is important to look at each of these events. Firefighter Rick Morris (54, Career), Sedalia, Missouri: Firefighter Morris died April 8, 2008, nine days after being burned in a flashover that occurred while attempting to locate the fire in a small single family dwelling He was survived by his wife and four children. Firefighter Bret Lovrien (35, Career), Los Angeles, California: Firefighter Lovrien died and Engineer Anthony Guzman was seriously injured March 26, 2008 from traumatic injuries occurring as the result of a smoke explosion while forcing entry into a commercial building to investigate smoke from a fire in a utility vault. Firefighter Lovrien was survived by his brother, parents, stepmother, and grandfather. Firefighter Justin Monroe (19, Paid On-Call) and Firefighter Victor Isler (40, Career), Salisbury, North Carolina: Firefighters Monroe and Isler died March 7, 2008 of thermal insult and carbon monoxide exposure following rapid fire progress (likely flashover) in a commercial fire. Three other firefighters also suffered burns in this incident. Firefighter Monroe was survived by his parents and brother. Firefighter Isler was survived by his wife and two children. Lieutenant Nicholas Picozzi (35, Volunteer), Linwood, Pennsylvania: Lieutenant Picozzi died March 5, 2008 as a result of injuries received due to rapid fire progress (likely flashover) while searching for the seat of the fire in the basement of a small single-family dwelling. Assistant Chief Kenny Dawson Jr., Assistant Chief Chris Durbano, and Firefighter Tom Morgan Jr. were injured while attempting to rescue Lieutenant Picozzi. Lieutenant Picozzi was survived by his wife and two children. Firefighter Brad Holmes (21, Volunteer) , Grove City, Pennsylvania: Firefighter Holmes died three days after he and and Lieutenant Scott King were burned as the result of flashover while conducting primary search on the second floor of a small two-family home on February 29, 2008. Firefighter Holmes is survived by his parents and brother. Two of these incidents have been documented by an investigative report. NIOSH Report F2008-06 examines the incident in which Firefighter Brad Holmes died. The Post Incident Report on the Salisbury Millwork Fire by the Salisbury Fire Department examines the circumstances surrounding the deaths of Firefighters Justin Monroe and Victor Isler (NIOSH Report F2008-07 is pending). NIOSH is also investigating the deaths of Lieutenant Nick Pilozzi (NOSH F2008-08) and Firefighter Brett Lovrien (NIOSH F2008-11). The status of these reports is listed on the NIOSH Firefighter Fatality Investigation and Prevention Program Pending Investigations page. Three of these fatalities occurred in small residential structures. Of these, one occurred on the second floor, one on the first floor, and the other in the basement. Two of these fatalities occurred in an exposure, not initially involved in the fire. Three of these fatalities occurred in commercial occupancies. Two of the fatalities occurred at a major, greater alarm fire. In one of these incidents, firefighters were searching for a trapped occupant, in all other cases; the firefighters were searching for the fire. It is critical to remember that extreme fire behavior can occur in any type of structure. In some cases, severe fire conditions are evident on arrival, but in others, there is little evidence of a significant fire. The sense of urgency resulting from persons reported, or a rapidly developing fire can result in tunnel vision and reduce focus on key fire behavior indicators (B-SAHF). It is essential to ensure that members have adequate training so that reading the fire is both second nature and a conscious part of their size-up and dynamic risk assessment process. This number is considerably lower than the 18 firefighters who died in 2007 where extreme fire behavior was a causal or contributing factor (four events accounted for 15 of the 18 fatalities). Does this reduction indicate that we are doing a better job of recognizing potential for extreme fire behavior and are controlling the fire environment more effectively to reduce risk during offensive operations? Examining not only line of duty deaths, but department incident reports, data submitted to the National Firefighter Near Miss Program and news reports of fire incidents involving extreme fire behavior I have the feeling that this reduction is not completely due to improved safety and operational performance. There have been a number of incidents over the last year that point to the need for continued efforts in the improvement of fire behavior training. Incidents in Loudoun County, Virginia (see Loudon County Virginia Flashover, Loudoun County Flashover: What Happened , Loudoun County Flashover: Escape from Floor 2 , and Flashover & Survival Skills Training ); Sacramento, California and Edmonton, Alberta resulted in multiple firefighters being trapped by rapid fire progress while working above the fire. In these incidents, a slight variation in circumstances or any delay in the action of those involved might have resulted in multiple line of duty deaths. These three incidents do not necessarily make a trend, but examining near miss, injury, and line of duty death data points to lack of or loss of situational awareness as a factor in this type of incident. Situational awareness is inclusive of the ability to recognize key fire behavior indicators, prediction of likely fire development, and recognizing the impact (or lack of impact) of tactical operations on fire progression. In an earlier post, Outstanding Performance I discussed the importance of deliberate practice in developing expertise. Numerous studies have identified that world class performance requires 10,000 hours of intensive and deliberate practice. While engaging in deliberate practice several hours a day, every day for ten years might seem a bit excessive to the average firefighter, performance is strongly correlated with an individual’s level of deliberate practice. Hard work pays off! Regardless of your level of knowledge and skill, I challenge you to increase your efforts to engage in deliberate practice. As a student of your craft it is critical to deepen your knowledge of fire behavior, examine incidents you respond to with a critical eye, and use case studies to gain insight into fire behavior, building construction, and the effect of tactical operations. Engage in safe and effective live fire training to provide an opportunity to apply your knowledge and skill in a realistic context. CFBT-US is using the following logo to identify training materials and activities that promote deliberate practice. Continue to be a student of my craft as a fire officer and educator, finding the time to engage in an increased level of deliberate practice. Continue working to reducing firefighter injuries and deaths due to extreme fire behavior by increasing firefighter’s knowledge of practical fire dynamics. Work to improve the quality of NIOSH Firefighter Death in the Line of Duty Reports by continuing to be a critical friend of the program. Work to improve the quality and focus of fire service training curriculum and training materials in the area of fire behavior. Work to ensure that professional qualifications and other consensus standards adequately identify the requisite fire behavior knowledge and skills for safe and effective operation on the fireground. Work to ensure that live fire training instructors have the knowledge and skills necessary to conduct safe and effective training. I encourage you to join me in this effort. These improvements will not happen overnight, but we can accomplish a great deal if we persist and work together. It is easy to complain and find fault. It is much more difficult to step up and do the right thing to make things better, but that is what is needed. Thanks for reading the CFBT Blog and best wishes for a safe and happy 2009.